Today promised and delivered another feisty Utah County Republican Party Central Committee meeting. The meeting was incredibly well attended, with 342 credentialed members. The big agenda item today was a proposed vote on whether or not to invalidate the last CC meeting (December), which was called by a petition of CC members and resulted in nixing the Party’s controversial practice of allocating ex officio (“automatic”) state delegates. The move to invalidate the meeting was proposed by 10 members of the Executive Committee (all ex officio state delegates) in what appears to be a case of sour grapes over losing their automatic delegate status. The crux of their argument was that proper notice had not been given (even though email, mail, website and phone call notifications were utilized). After both sides presented their arguments, the CC voted overwhelmingly to retain the meeting as valid by a 220 – 113 vote. Legislative District elections were also held today; the results can be found on the UCRP website. I find it interesting (and inconsistent) that some of those who initiated and supported the fight to invalidate the December CC meeting – a move which was soundly defeated by CC members – were elected by those same CC members to lead their Legislative Districts. I guess we can expect to see more of the same political behavior during their two year terms. The Committee expected to take up the appeal of Jeremy Roberts, the Party Secretary who was removed from office by the Executive Committee as a result of a complaint of mal- mis- or non-feasance in office. Surprisingly, Jeremy submitted a letter of resignation rather than following through with the appeal. However, a formal vote on the appeal was still necessary, and the committee voted not to overturn the Executive Committee’s decision to remove. Jacki Wilson and Jessica Christopher gave us some great Caucus training, and the Party is eager to host the Republican Caucuses coming up on March 15 at 7:00 p.m. (locations pending). I would like to clarify a few things in regard to this meeting. First, there is not supposed to be any bylaw discussion. Accordingly, the Constitution and Bylaws Committee is not introducing any business. The main focus of Saturday’s meeting is training and elections. Let’s stay focused. Second, some inaccurate assertions have been made in regard to the December 10th meeting. As a former and current member of the Constitution and Bylaws Committee, one of the drafters of the two B114 proposals, and one of the petitioners for the December 10thmeeting, I would like to respond. Assertion #1: The Bylaw 1 (B114A) change was rushed through. Fact: The Constitution and Bylaws Committee has been actively working through this issue for over 2 ½ years. We hosted two panel discussions: one on 1/30/10 and another on 9/20/11. Both were advertised by email to all Central Committee members. We have done a survey of the Central Committee. Multiple members of the CBC have written proposals. These proposals have been discussed extensively in our committee. The issue has been a main focus of the CBC and the CC for several years. The proposals we finally introduced gave the Central Committee full latitude to go incrementally from no ex officio state delegates at all to preserving the status quo. The issue was discussed extensively at the November 17th meeting, where we had ballots in-hand when the clock ran out. After all of this, the CC voted, at the December 10th meeting, to retain NO ex officio state delegates. Assertion #2: Notice was insufficient. An old list was used. Fact: The notice for the December 10th meeting was more extensive than for any previous meeting. One observer noted, with a smile, that it was “over-zealous.” Attendance was the second highest ever. The list used was the most current official list. Postcards are a courtesy, not a requirement, but they were still sent to all 548 members on the list. Emails were sent to everyone who supplied an email address. Those who did not supply email addresses were called individually and either spoken with directly or detailed messages were left. If emails bounced, either correct email addresses were found or the members were called. Detailed records of those calls were kept. The EC members who claimed not to have received notice meant, as they later clarified, that they had not seen the postcard, but they had received emails. The VC who did not receive notice was Barbara Petty’s new LDVC, whose name had not been given to those compiling the list. Barbara failed to make the correction, even after being asked twice by Cory Maloy to update her LD list. Assertion #3: Bylaw change B114A violates RNC rules. Fact: A majority of the members of the County Constitution and Bylaws Committee, members of the State Constitution and Bylaws Committee and multiple parliamentarians say that RNC Rule 15 (c) (12) does not apply to this bylaw change. Assertion #4: The Central Committee can invalidate any meeting it wishes to invalidate at any time. Fact: The Central Committees does not have the authority to invalidate a meeting. Correct procedures should be followed. The delegate allocation issue has finally been voted on, after years of argument and delay. It is time to put this fight behind us and move on so that our party can make a difference in the larger scheme of things. Thank you, so much, for serving on the Central Committee. We need you to come and represent your precincts, be trained and VOTE for new Legislative District Officers. Let’s work together to make this the best caucus/convention season yet! Credentialing opens at 8:30 a.m. The circus is back in town. At last Thursday’s UCRP Executive Committee meeting, 10 members (all ex officio state delegates) voted to recommend invalidating and overturning the Central Committee’s recent vote to allocate all state delegates to the precincts that earned them. (credentialing opens at 8:30 and closes at 9:30). Best attendance for a CC meeting since the county convention (275 credentialed attendees). Only one other ever had higher attendance in the past several years. The Steering Committee had 7 days to veto, and the veto deadline passed with no veto. There is no provision for “invalidating” a meeting in our bylaws . The national party rule (15c12) that was originally expressed as a concern applies to state party rules that “materially” affect the selection of national delegates. The Dec 10 CC meeting changed no state party rules–only a county party bylaw. However, there are other parts of the cited national party rule (15c12) that the state and county party have knowingly violated for years, including 15c2 (caucus participants can’t “register” as Republicans at the caucus, and then participate) and 15d4 (ex officio delegates selected or elected before the beginning of the year of the convention cannot participate in the convention–this would disqualify half of our ex officios this time, and should have disqualified almost all of them, four years ago). The EC is made up COMPLETELY of ex officio state delegates, who have a direct conflict of interest, in that B114A reallocated their ex officio state delegate to the precincts that earn them via the RRS formula. Don’t let the ex officio delegates tell you that you can’t reassign their seats to the precincts! Bylaw proposal B114A, which passed in the Dec 10h meeting by an uncontested 144-130 vote, reassigned ex officio state delegate slots to be allocated to the precincts for election in the precinct caucuses on March 15th. Previously, those 80-ish seats had been assigned to elected officials and higher-than-precinct party officers. The ex officios on the EC decided by a 10-5 vote that the will of the CC should be overturned, and made that recommendation to the CC. The proponents wanted to have the EC invalidate the CC’s Dec 10th meeting, but it was determined that the party bylaws did not give the EC that authority. David Acheson and Cory Maloy abstained. 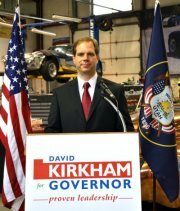 Today Provo businessman David Kirkham announced that he will enter the race for Utah Governor. Read more about his announcement at the Daily Herald. A proven conservative leader, David Kirkham launched the Utah Tea Party movement in 2009. He travels the state promoting limited government, lower taxes and constitutional principles, and inspiring Utahns to protect their liberties by becoming involved in the political process. 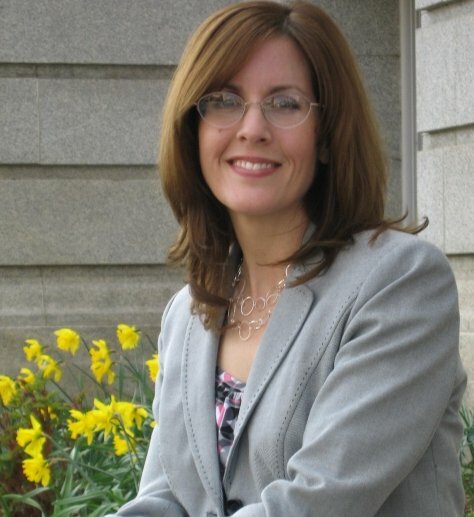 Kirkham recognizes that Utah needs a leader willing to stand strong and use all legal means available to protect our state sovereignty and reclaim ownership of vast amount of Utah land claimed by the federal government. He is focused on raising the level of responsibility, transparency and accountability in Utah government. Kirkham is also dedicated to championing local control and choice in education. President of Kirkham Motorsports in Provo, Kirkham is an innovative entrepreneur experienced in creating jobs, sound fiscal management and finding innovative solutions to tough problems. Kirkham Motorsports has been part of the Provo community for 17 years and is one of the leading manufacturers in the component car industry. Kirkham has worked in Greece, Sweden and on a nuclear nonproliferation project in Russia, where he helped transition Russian nuclear weapons engineers into Russia’s new free market economy. Kirkham traveled to Poland in 1995, where he encountered an economic system devastated by socialism. He employed the principles of capitalism to create a successful automotive business out of the ruins. He successfully fought a hostile government takeover of that business. Today, he sees the dangerous federal slide toward socialism encroaching on Utah, and recognizes the critical need for a leader who will defend our sate against policies that ruin economies and societies. Fiscal responsibility, innovation and creating jobs through entrepreneurial spirit are the principles that will propel Utah toward a bright future. 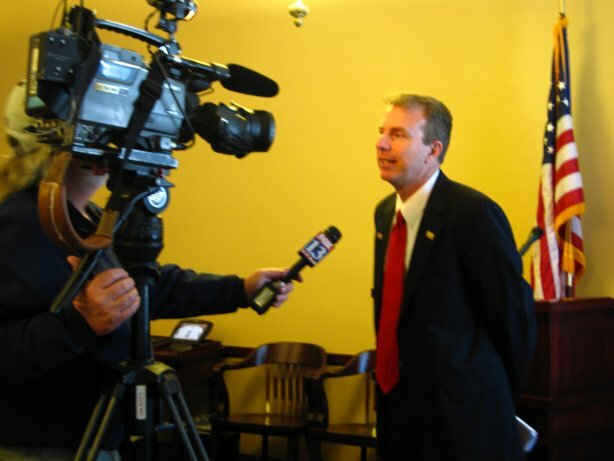 Today Utah Representative Chris Herrod (R-Provo) announced that he is running for the office of US Senate. Chris made his announcement at the state capitol, surrounded by dozens of friends, family and supporters. 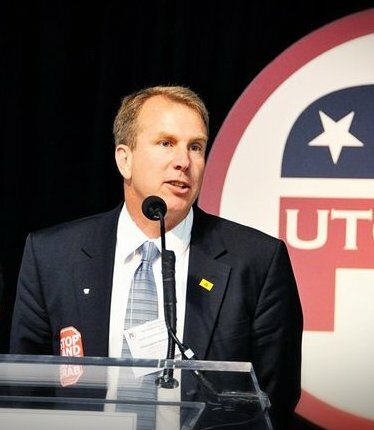 Representative Chris Herrod addresses delegates at the 2011 Utah Republican Convention. At the press conference, friend Arturo Morales introduced Chris as a man of integrity, principle, courage, vision and humility. Chris has consistently stood for principles and truth, even if he had to stand alone. “I see in Chris the characteristics of a modern-day George Washington,” Morales said. Alia Herrod, Chris’ wife, also spoke briefly. As a legal immigrant from the Ukraine who once lived under communist and socialist oppression, she said she never thought she would have to stand in front of Americans and urge them to wake up and defend their freedoms, but that day has come. Chris Herrod spoke about his goals to take America back to the constitutional principles it was founded on in order to avoid the fiscal and social meltdown headed our way if our government continues its spending spree. “We need to bring the recession to Washington,” he said. Herrod also spoke of his growing anxiety that our country is headed down the path to socialism. Having lived abroad and taught free market business principles in the former Soviet Union, Herrod has experienced the results of socialism first-hand and does not want to see the U.S. fall into a such a dreadful system. He said he hates socialism because it robs individuals of their full potential, weakens the family and eventually morally and financially bankrupts a society. He said energy independence and financial independence are national security issues that must be pursued, and carefully developing our natural resources will help spur our economy in our small towns, our state, our nation and even abroad. Developing our natural resources also will bring in more money for education, he said. Herrod announced that he will not resign from the Legislature to pursue his bid for the Senate, but will remain and fulfill his duties to his constituents and to follow-through on legislation he is sponsoring – this announcement was met with a round of applause. Because legislators are barred from raising campaign money during the legislative session, Herrod said he will be running a fiscally conservative grassroots campaign, and invited all to step up and help elect him as our next US Senator from the great state of Utah. 2012 will be an exciting and critical year for our district, Party, state and nation. With all of the challenges and opportunities we will soon face, I believe it is more important now than ever to have engaged, dependable and dedicated legislative district leadership. We will be electing new legislative district leadership at our Central Committee meeting, and I ask for your support as a candidate for Legislative District Chair. I have appreciated and enjoyed the opportunity of serving as your Education Officer for the past 4 years. I will use the experience I have gained and the bonds that we have forged as a district to move our Party and our principles forward. My dad was a WWII veteran, and back in the day of typewriters he used to test his ribbon ink by typing the phrase, “Now is the time for all good men to come to the aid of their country.” As our national debt skyrockets, socialism encroaches, and power mongers seek control, now is not the time to become discouraged and step away from the political fight — now is the time to step up! Now is the time for all good men and women to come to the aid of their country. I am running for Legislative District Chair because I am dedicated to promoting our Platform, defending the Constitution, protecting our unalienable rights, and working to elect exceptional Republicans who pledge to do the same. Accomplishing these goals begins in our precincts and in our legislative district. 1) Caucus – It is critical that our caucuses are well planned, our precinct leaders well trained, and that our neighbors are engaged in the process. We must make this caucus a POSITIVE experience for all involved so they come away with a favorable perception of the caucus system. I will work to ensure that we have the planning, training, and tools we need to conduct great caucuses. Our caucus system is under attack, and I pledge to defend the grassroots caucus/convention system that keeps political influence where it belongs – in our hands, in our neighborhoods. 2) 2012 Elections – This is a crucial election cycle. I will work to make sure District 61 continues to be represented by Republicans on county, state and federal levels. I will work with the Party to ensure that our candidates have the resources they need to win, and once we’ve secured our district we must do what we can to retire Jim Matheson and Barack Obama! 3) – Get Out the Vote (GOTV) – I will make sure that you have the information and resources you need to make GOTV within your precincts simple and effective. This election is important for your precinct — the number of Republican votes cast in your precinct will determine how many delegates you earn for the next two caucus cycles. It is vital that we succeed with GOTV so that we can earn as much representation as possible. 4) Executive Committee Representation – The Legislative District Chair is your representative at monthly Executive Committee meetings, where key Party planning and decision making occurs and where Central Committee meeting agendas are formed. I will raise the bar for representation by emailing you a meeting notice beforehand, seeking your input on topics you want discussed, and following up with minutes afterward. This is a great venue for bringing forward your concerns and ideas, and for proactively promoting civil discourse and unity. I have already been attending these meetings regularly – even though I am not a member of the committee – in order to stay informed about Party matters. As Chair I will make sure your voice is heard in this important committee. 5) Communication and Education – District 61 has been actively engaged in efforts to communicate with and educate our officers, delegates and the general public. An educated electorate is vital — people are more likely to be engaged and empowered when they are knowledgeable. I have worked with the Education Officers team to create educational materials for caucus, GOTV, officer/delegate training (and more), which will help us be more effective in our roles and in our neighborhoods. Communication between all levels of Party leadership is vital, and I will ensure a comfortable flow of information. As your Legislative District Chair I will make sure you have the tools, resources and support you need to accomplish your precinct’s goals. I look forward to continuing to work together to promote Republican principles and candidates. I ask for your vote for Legislative District Chair. Happy New Year! At least a dozen new state laws kicked in on New Year’s Day, including the new maps created during the 2011 redistricting process (you can view the new maps on the Lt Governor’s website). Check out the full story in the Salt Lake Tribune’s news article.